Pony Pasture Rapids Park is an urban paradise for many. A cheap way to make the best of one’s day for those that can’t afford a trip to the beach or don’t have the time to leave the city for a vacation. 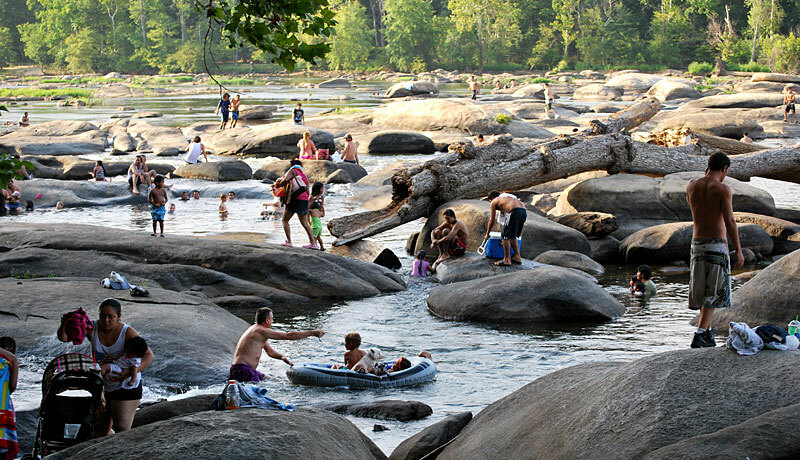 The exposed granite boulders are a big draw for Richmond’s rock hoppers and sunbathers. Family gatherings are as popular as inner tubing, kayaking, swimming, fishing and partying. But there are many people who take the pristine park conditions for granted. It takes a lot of work to keep human interference from tarnishing Pony Pasture’s natural beauty. Between the James River Park System’s staff and the many volunteers and dedicated park-goers, the work gets done. I am one of those proud people and Pony Pasture Rapids Park is now my park. Actually, many people own the park, and taking ownership is encouraged. After all my years of using the park, I’m now volunteering my time to maintain it and defend it from those that abuse it. I spent five hours clearing trash and helping people park cars at the west Richmond park on the hottest day of the summer. The official high that day was 105 degrees, beating the record of 99 for July 25. Didn’t matter, the park was packed. I can claim four garbage bags worth of trash and recycling. I had help, as people who saw me coming with my trash bag would volunteer things they had collected from the river. It was good to have children helping a little, especially with aluminum cans. 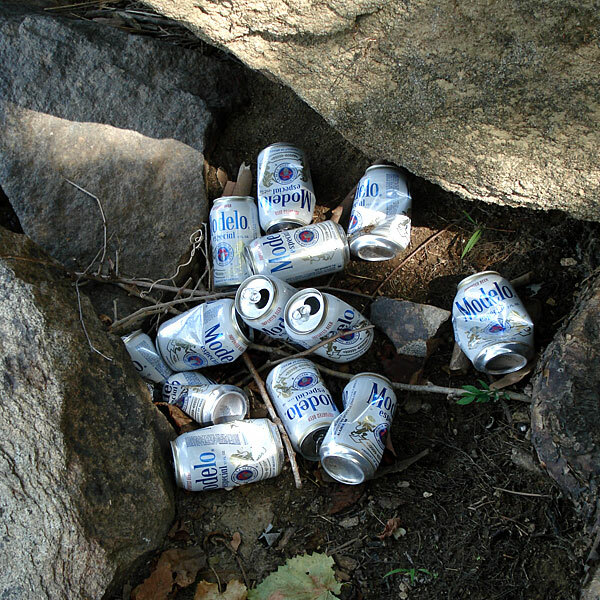 Other than all the of senseless disposal of diapers all over the place, the worst part of clearing trash was a six-pack of glass bottles smashed on the rocks. That malicious act took the longest to clean. I also found an enclave of more than 80 cans, bottles, boxes and food containers that was about as bad as it gets. The worst part was that a trash can was only 15 feet away. Trash in, trash out people. I think the cigarette butts were the most disappointing thing I found. Smokers know better and should be prepared to clean up after themselves. I found 70-plus butts in one spot. The location suggested to me that it was obviously a good spot to see nature more than people-watch and I was disgusted by the lack of respect for the outdoors. Parking is another issue at Pony Pasture. 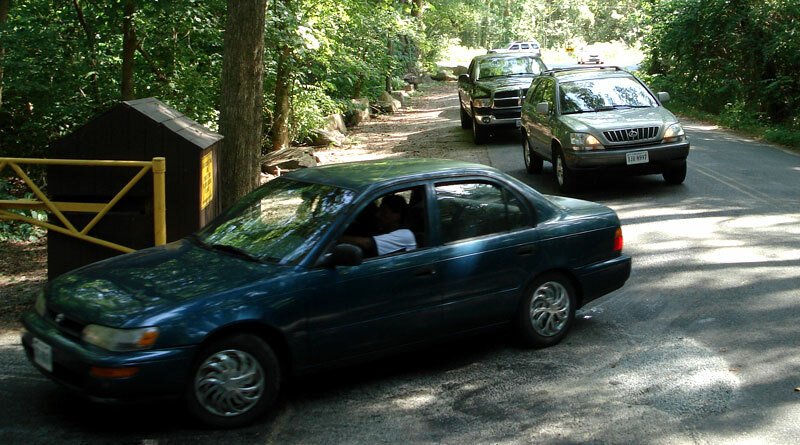 Between 1 p.m. and 6 p.m. on most summer weekends, the lot gets full and the park system workers and volunteers help manage the flow of cars into the park and keep everyone happy, according to park manager Ralph White. By 3:30 p.m., the line to get into the lot was 20 cars deep and the wait was about 20 minutes. The lot — which is the largest in the park system — has 80 parking spaces but can be expanded with creative management to 110 spaces, White said. “In the early ‘80s, riff-raff was so bad, people petitioned to have the park closed – twice,” White said. The Pagans and Hell’s Angels motorcycle gangs were a big part of the problem, he said — doing donuts with motorcycles in the gravel, smashing car windows, starting fights, drinking, doing drugs, womanizing, etc. Pony Pasture was a rowdy and untamed place in those days and citizens weren’t happy, but the park was never permanently closed. That was a long time ago. The park seems to be more popular now than ever and keeping peace and harmony for a diverse and multiculural crowd on a hot day is beneficial to everyone. “It’s a parks issue, not a police issue,” White said. Having the parks department and volunteers run the parking lots at peak hours frees police from having to dedicate several cars to patrolling the park. White said Richmond police usually dedicates one unit to Pony Pasture on the weekends. “There is no one breaking into cars or starting fights… and everyone gets along much better,” White said. Having attendants manage the parking lot at peak hours has helped ease tensions and people seem to respect the park more now. While I was there, the police mostly concerned themselves with the cars in line for the parking lot that blocked westbound Riverside Drive. There were no calls for Emergency Medical Services, no rescues, no arrests that I saw. Everyone was getting along, despite the close quarters, heat and huge crowds. There were at least seven volunteers, including a two couples that lived near the park that like to ensure that their neighborhood is well-maintained. Another young man volunteered in the park all day doing whatever the parks department had for him. He is a regular and has taken ownership of his Pony Pasture. I will continue to volunteer. The afternoon didn’t seem like work. I was earning time to enjoy my James River. If you see something you don’t like about any city park, take action. Take ownership. Make the park yours. Find out how to help the James River Park System or any of the volunteer groups: Friends of the James River, James River Outdoor Coalition and the City of Richmond’s Department of Parks, Recreation & Community Facilities. I loved the post. My son and I have started to take a plastic bag with us each time we go fishing in the James. When we stop fishing we fill the bag with trash on the way back to the car. I agree a crack-down by law enforcement would be a great idea. It would be great if some plain clothes officers would show up on a beautiful weekend day and in plain sight of everyone issue citations for littering and public consumption. Word would spread that the police are watching and are willing to do something. I would bank that the amount of fines would easily cover the costs of having officers in the park. Thank you for this post and your dedication. Hopefully more people will learn to take ownership of their parks. Thanks for the work you do Phil, both online and in the parks! I too get frustrated with the carelessness of some park users but I volunteer my time to pick up trash in the James River Park system when I can. Honestly I think a few weekends of plain-clothed police officers writing pricey littering tickets throughout the park system could send the right message. Some people are just clueless and some don’t care. All the signs in the world won’t change that but rumors of police enforcing litter laws just might. I always end up picking up trash when I go to the James River Parks and am also amazed how much people leave behind.